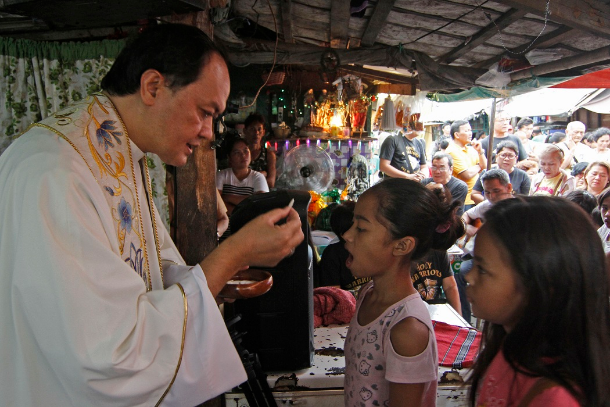 February 7, 2019The letter arrived at the bishop’s residence in Kalookan, a diocese north of Manila, a few days after the New Year celebrations ended. The handwritten message came from a group of boys who asked their bishop’s “permission” to celebrate Mass in their community. 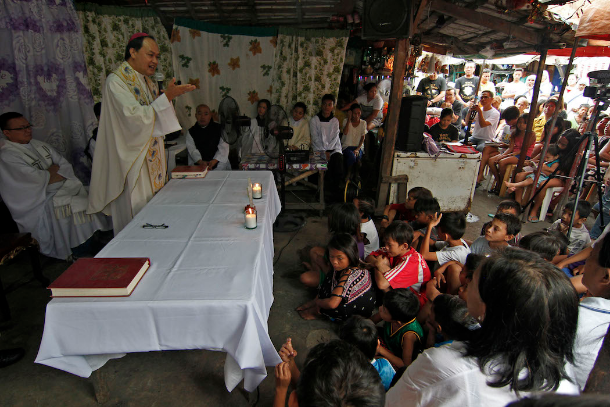 “We are asking permission for you to celebrate Mass at Market 3 … because that is where we live,” read the letter, which was written in Filipino and addressed to Bishop Pablo Virgilio David. “We believe that if you bless our community peace will be granted from God,” wrote the children. They then promised to introduce the bishop to their “parents, siblings and the community who are all seeking peace. “The children said “lives would change a lot, especially those of people addicted to illegal drugs,” if the bishop would come and celebrate Mass. Crimes, from petty to serious, are rampant, and illegal drugs proliferate in the community of workers at the nearby fish port who believe that using “shabu,” a slang term for methamphetamine, will help them survive hunger and sleepless nights. The Market 3 area was thrust to the forefront of the government’s bloody war on illegal drugs after President Rodrigo Duterte came to power in 2016 promising to rid the country of narcotic-related crimes. In January 2017, the entire slum almost burned to the ground. Authorities said the blaze started inside a drug den that caught fire. In a matter of days, people rebuilt their community, but the killings and abductions have continued. The organization cited the killings of over 1,000 people in 2018, attributing them to the Duterte administration’s war on drugs as proof of its claim. The same report placed the Philippines alongside Syria, Nigeria, Yemen and Afghanistan as among the deadliest countries for civilians in 2018.Syria topped the list with more than 7,100 civilians killed, while a combined total of about 7,600 were slain in Nigeria, Yemen, Afghanistan and the Philippines, which occupied the next four slots, according to the report. The Philippine government described the report as ignorant and biased and accused local and foreign media of disseminating fake news. The Philippine Drug Enforcement Agency, however, said that 5,104 “drug personalities” had died between July 1, 2016, and Dec. 31, 2018, during police operations. Figures from the government’s #RealNumbersPH report also showed that 167,135 people had been arrested during the same period. Most of the killings and arrests occurred in urban poor communities like Market 3 in Bishop David’s diocese. The children’s letter was “an invitation that could not be refused” by the bishop. He himself admitted that he felt the children’s strong desire for peace and an end to violence and killings in their community. 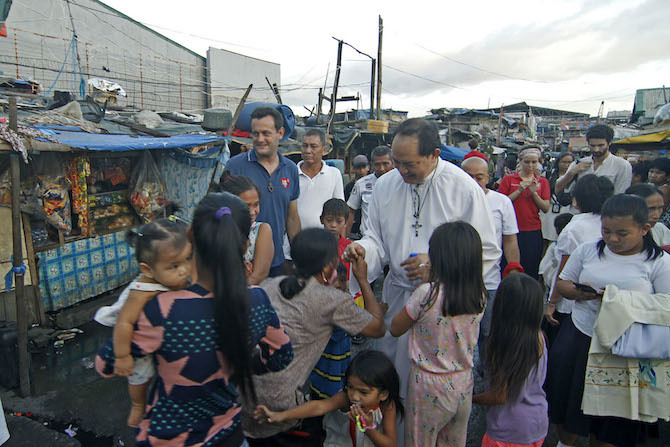 A week after receiving the letter, Bishop David decided to accept the children’s invitation and visit the community. Christ is the soaring eagle that landed and stayed to show us how to fly and soar into the vast skies.” He reminded them not to act with cruelty to others amid the challenges they face. Cruelty and persecution turn perpetrators into animals, he said. “It is easy to be human but it is difficult to act as one,” said Bishop David. Authorities said drug syndicates were using children as “runners” to transport drugs from sellers to clients. 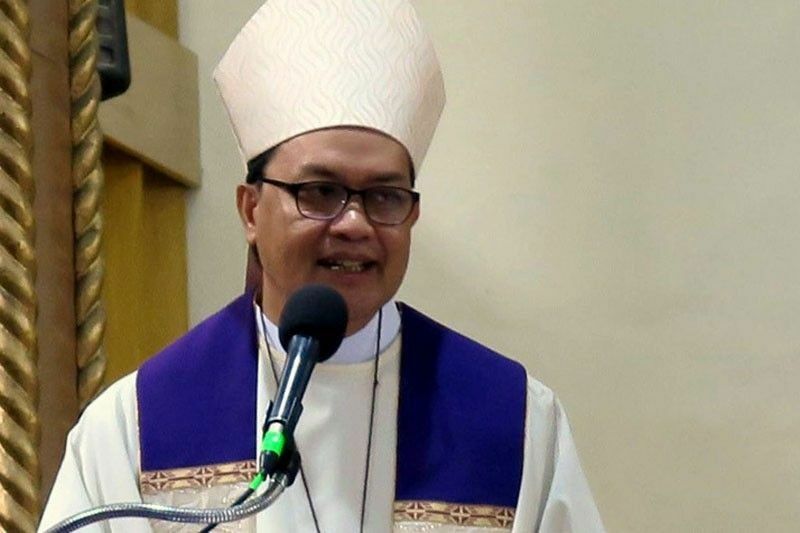 “Children should never be treated as criminals, not even when they get caught doing errands for pushers and suppliers,” the prelate posted on his social media account on learning of the arrests. “They should rather be treated as victims who need to be rescued from adults who use them for their criminal activities.” In a media briefing during the last week of January, government officials claimed that 927 children aged 10-17 were rescued in drug operations last year. Not included in the report were the 54 children reported killed during operations since 2016 based on data gathered by the non-government Children’s Legal Rights and Development Center.